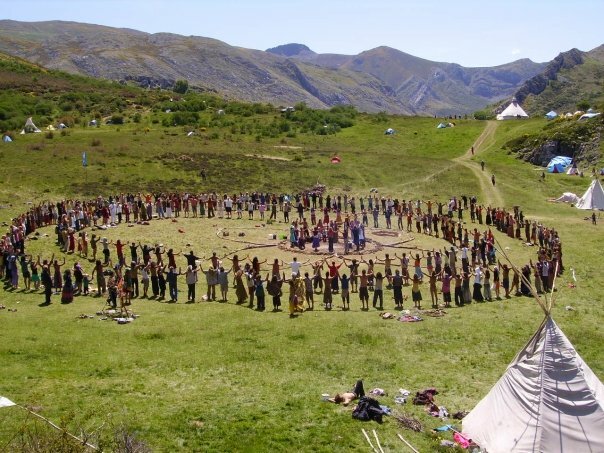 They will be known as the warriors of the Rainbow"
Once upon a time here there was a brief list of some public upcoming gatherings of the Rainbow Family. Where are the rainbow gatherings? Where is the calendar and event list now? You can find a list of events and a calendar of gatherings at RainbowForum.Net . It asks for a username and password, but the subscription is easy and free. I have to say goodbye for a while. It's been two years of this site, 160000 visits, and many of you writing me everyday. But my main project now is taking care of these little two newborn angels, Sula and Phoenix, with my partner Lezanne. Life is beautiful. Love, brothers and sisters. If you are looking for a public list of gatherings, forums, family pages, and other information related to gatherings and communities then RainbowForum.Net is a place to visit, with free registration. If you are looking for sharing photos and warm wishes then the Rainbow Gatherings Facebook Group is a place to visit. And if you are looking for a list of gatherings that don't want to be spread across the Internet but by "word of mouth" tradition, then Rainbow Family Haven is a place to visit, but you need some Haven members to vouch for you to become a member.